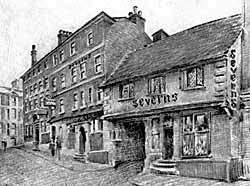 Sketch of Severn's wine and spirit shop on Middle Pavement. The 15th century building was dismantled and re-erected on Castle Road in 1970; the rest of the row was demolished. RETURNING to Weekday Cross we leave it by that short thoroughfare which is called Middle Pavement. There is not much of interest left in this little street, perhaps the quaintest object in it is the curious little yard which leads off the western side to the rear of Messrs. Severn's wine and spirit stores, for by some curious freak of chance this has remained almost unaltered for centuries and still presents an ancient inn yard such as must have existed in plenty throughout the town when Nottingham was little more than a country market town. The district, however, is of interest for at the corner where Fletcher Gate enters Weekday Cross stood the house in which Philip James Bailey the author of "Festus" was born. The family of Bailey was of considerable note and a hundred years ago gave to the town two of its most prominent sons: Thomas Bailey, the historian and Philip James Bailey, the poet. Apparently the family was founded by Philip Bailey who was a stocking maker who at one time resided in Portland Place, Coalpit Lane and then moved to Black Lion Court off Castle Gate where he had a workshop. He received the appointment of the town gaoler which was a position of considerable responsibility and honour and he moved to the house which stood in Weekday Cross and which has now disappeared, albeit its site is marked by a tablet. Philip was early associated with the stocking trade, but eventually he changed his business and became a wine merchant at the top of Low Pavement; thence he removed to the Moot Hall at the corner of Friar Lane where his business prospered. Eventually he retired from the wine trade and became a journalist and established the weekly newspaper, "The Nottingham Mercury." He removed to Basford to the house which is still standing close to the church of St. Leodegarius where he died in 1856. He wrote a good many works, but the most important of these is his "Annals of Nottinghamshire" which is a standard work of reference even to our own day. His son Philip James Bailey was born in 1816 and his great poem "Festus" which I have heard it said, contains more words than the whole of Shakespeare's published works was mainly written at Basford although it was constantly added to and altered during the whole of the poet's long life. 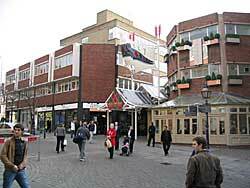 The charmless buildings either side of the entrance to the Broad Marsh Centre that replaced Severn's shop (A Nicholson, 2004). Bridlesmith Gate is of extreme antiquity although it does not belong to the oldest road system in Nottingham. It was constructed as part of the Narrow Marsh—Drury Hill route which passed to the west of the ancient enclosure on St. Mary's Hill. The old defences of Edward the Elder's time, and possibly earlier, ran where the houses on the east side of Bridlesmith Gate now stand so that the road itself must have passed very close to the edge of the ditch, on its outer side, if there was a ditch. 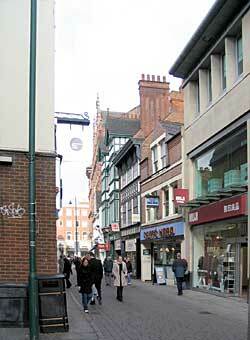 Even to-day it is an extremely narrow thoroughfare and it is very difficult for us to realise that all through the middle ages and even down to a century ago it was the chief shopping street in Nottingham. This importance is interestingly reflected if we consider that in 1819 of the ten gas lamps which were considered sufficient to illuminate the whole of the town, five were allotted to Bridlesmith Gate. Its name is very ancient. It was called Bridlesmith Gate or something very like it as long ago as 1304 and it reflects something of the importance of the smiths of Nottingham. Other streets of course show this importance, for we have also Gridlesmith Gate or Great Smith Gate which we now-a-days call Pelham Street and Smithy Row. Such a wide diffusion of names in so small a town as ancient Nottingham must have been, shows that the smithing industry must have occupied the attention of a great many people. And when one considers the history of Nottingham and realises that Nottingham Castle was one of the chief fortresses and Royal Palaces of England, to which the baronage was continually called for councils and parliaments, one realises that probably the smiths would find much occupation in making armour, although I know of no armour remaining in England which was made in Nottingham. Bridlesmith Gate in the mid-19th century. The armourers' craft was exceedingly skilled; that is evident if one examines the articulation of the suits of ancient armour that have come down to our day, and consequently the armourers and the smiths associated with them must have been exceedingly skilled craftsmen. But the introduction of gunpowder and the suppression of private war dealt a fatal blow to their trade, and many of them must have found themselves out of employment so they devoted their attention to the production of beautiful wrought ironwork which might be used for architectural purposes. By the 18th century it was the fashion for the better class houses to be set back a few feet from the roadway and the area in front of them to be enclosed by wrought iron palings of elaborate designs, sometimes also these palings would be pierced by exceedingly elaborate gateways. We have a few examples of these palings and gateways still remaining in Nottingham, noticeably that one by the side of the People's Hall in Heathcote Street. Another example of wrought iron craftsmanship may be studied on the sundial of Collin's Alms Houses in Spaniel Row the gnomon of which is an exceedingly beautiful specimen of ironwork. The names of these wonderful craftsmen have not survived except in one case, namely that of Huntingdon Shaw, who was possibly born in Red Lion Street and who was baptised in 1660 in St. Peter's Church. He was associated with the great French artist Jean Tigou in the construction of the magnificent gates at Hampton Court and it is very doubtful whether anything of his workmanship is to be found in the neighbourhood of Nottingham although the gates at Watnall Hall are attributed to him. At any rate his skill was so great that a little jingle "The little smith of Nottingham, He doth the work that no man can" was made about him and has survived to our own day which shows that he must have been skilled above his fellows otherwise no such rhyme could have possibly obtained sufficient celebrity to last for 200 years. But wrought iron quickly oxidises and it was found that it was a very perishable material to leave exposed to the inclemencies of the weather and so cast iron was used in its place, for the skin formed by the casting of iron acts as a protection against the weather and diminishes the rapidity of its weathering. Further, it was very much simpler and cheaper to adopt the mechanical process of casting palisades and other architectural details than to use the costly process of beating out by hammer and anvil elaborate patterns. The loss to the artistic world was very great indeed, the difference in the process being that of craftsmanship as against manufacturing. Bridlesmith Gate today (A Nicholson, 2004). In Bridlesmith Gate or somewhere near it on a site now lost was a mint in Saxon times which remained working down to the fire of Nottingham in the terrible reign of King Stephen at which time Sweyn the moneyer whose story we noted in Commerce Square was in charge. In 1810 the narrowness of Bridlesmith Gate had become intolerable for traffic could not circulate in it with any degree of comfort and so money was collected for the purpose of widening it and a start was made at High Pavement on the western side. But the money soon gave out and the proposed improvement had to be abandoned, but not before a hundred yards or so of the street had been widened so as to admit of the passage of two carriages. This widening still remains and accounts for the curious shape of Bridle-smith Gate at its juncture with Low Pavement. 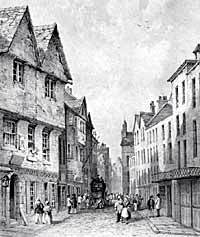 But in 1819 another attempt was made and although no widening took place the street was much tidied up and modernised. By a general agreement of all the inhabitants the old hanging signs which did so much to block up the thoroughfare were all taken down. The footway was paved, it must have been one of the earliest paved footways in Nottingham, and the carriage track was re-paved with boulders. Our forefathers were so pleased with this improvement that they changed the name from the ancient one of Bridlesmith Gate to Bond Street, after the well-known Bond Street in London which was just then attracting general attention. Evidently this change did not meet with public approval and it was soon abandoned.